On the 4th of January, I jetted off to Malaysia, Cambodia & Vietnam. Trigger happy with a camera as always, something strange seems to happen when abroad. My confidence and audacity increases tenfold. I seek out opportunities for a picture that I just would not consider back home. Perhaps its the anonymity, perhaps the extra boost of adrenalin being in a foreign place with countless new sights, sounds and smells. The joy in capturing moments when every day is an adventure fills me with a peculiar kind of thrill. Maybe, I'm just worried that I will lose the moment to memory and never able to recall it; or maybe it's my way of becoming 'focussed' (pardon the pun), and a way of becoming selective amongst the plethora of information going on about me. At some level, it is an addictive activity, acquiring stolen moments from people, places and experiences which contribute to the fabric of being. The children of these countries always bring something extra to the moment. Their candid playfulness and curiosity mirrors my own when wandering around a foreign place, eager to see what adventure lays around the next corner; fearless like an old explorer. 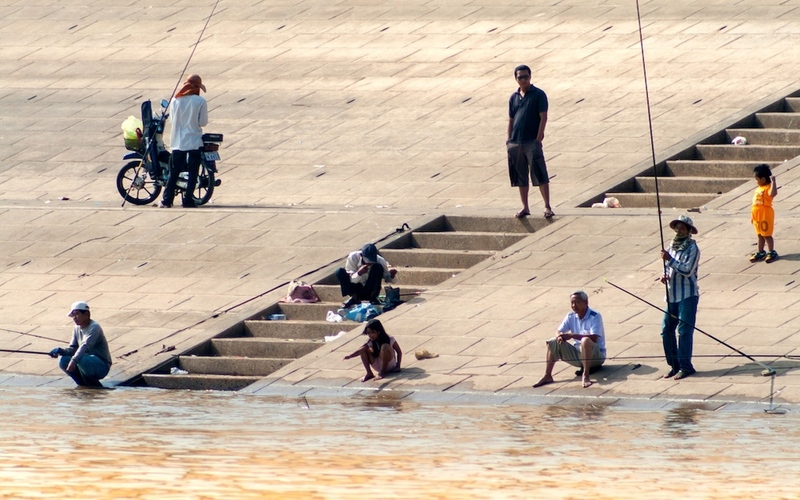 People caught up in their usual daily activities, like fishing on the banks of Ton Le Sap in Phnom Penh (see below), or sculpting in class provides another way 'in' to the moment, as long as you can hide behind a camera and be an obvious as a traveller gathering information as if you'd only just arrived on planet earth and never seen such a thing!